Most drivers know the helpless feeling of their vehicle hitting black ice or snow and suddenly starting to slide after losing traction. A momentary skid, however, doesn’t have to mean a collision. If you know how to react, there are a number of ways to regain control of your car before it skids off the road or hits another vehicle. About 2 percent of traffic fatalities nationwide are caused by winter weather, according to a carinsurance.com article. Many more wintertime accidents involve fender benders or sliding off the road. Many drivers wisely choose to stay off the roads during icy conditions. Those who do brave the weather should drive more slowly. Some motorists wind up in collisions or a ditch because they drive too fast for road conditions and lose control. Drivers who disregard safety and drive too fast for road and weather conditions pose a danger to other motorists and pedestrians. Avoid panicking: One of the most important things to understand is that you often can regain control of a sliding vehicle. 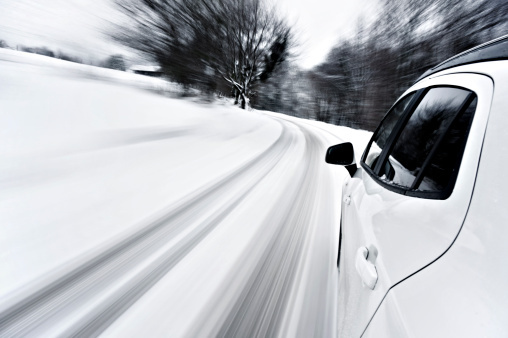 Take your foot off the gas: Slowly accelerating and decelerating in snowy and ice weather helps you control the vehicle. Once you’ve started sliding, though, the best way to cut speed and regain control is to remove your foot from the gas pedal. Release the brakes: Antilock brakes (ABS) are not made for top performance on ice and are likely to lock up the vehicle’s wheels, icyroadsafety.com reports. Wheels that are sliding can’t be controlled and steering won’t change the direction the vehicle is traveling if the wheels continue to slide. Turn into the slide: Steer the vehicle in the direction the back end of the vehicle is sliding. This is called turning into the slide. Once the tires regain traction, focus your eyes in the direction you want to travel and turn the steering wheel in that direction. Don’t white knuckle it: Instead of putting a vice like grip on the steering wheel, handle it loosely and avoid overcorrection in your steering. If you turn too far, start steering in the opposite direction. Understand how the brakes work: Threshold braking, in which you keep the heel of the foot on the floorboard and use the ball of the foot to put firm, steady pressure on the brakes can help you regain control, according to the American Automobile Association. Once you feel the brakes begin to lock, however, you should release them. Do this rather than pump the brakes. Accelerate and decelerate slowly: Easing onto the gas pedal can help you get traction and stay away from skids, but never try to make a rabbit start. When slowing for a stop light, take your time because you’ll need more distance to come to a complete stop on a snowy or icy road. Drive slower than normal: Allow plenty of time for maneuvering because acceleration, stopping, and turning all take longer on snow and ice. Keep more distance between your car and the car in front: In normal conditions, you need three or four seconds to stop, but that increases to eight to 10 seconds in winter weather. Avoid stops: When approaching a red light, try to slow the vehicle down so you can keep rolling through an intersection when the light turns green. Avoid trying to overpower hills: Giving the car too much gas while going up a hill will make your wheels spin. Let inertia work for you and carry you to the top, then as you reach the hill’s crest, slow down and go over the other side as slowly as possible. Never stop on hills: Once you lose momentum while going up a hill, you won’t be able to make it to the top. Don’t go out: Unless it is an absolutely necessity to drive, stay at home. You might be an excellent winter weather driver, but others probably don’t have the same skills. Enjoy the wintry scene from the warmth of your home rather than at a crash scene.